Rioned supplies manual spring machines in addition to electrical drum and suitcase machines for professional cleaning of drains and sewers upto a maximum diameter of 250 mm. Rioned supplies a wide range of high pressure jetting machines. 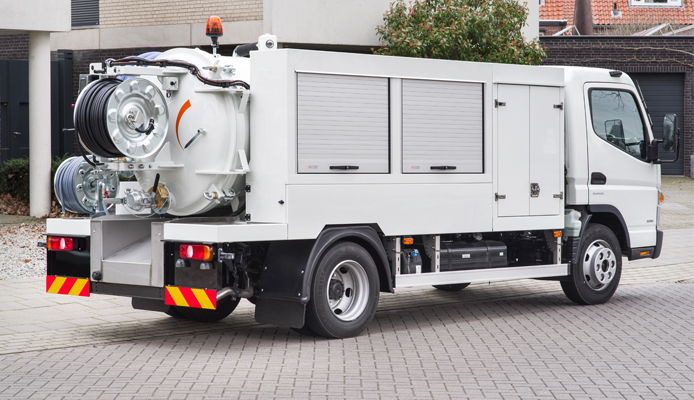 There are skid mounted machines for daily intensive use, but also versatile trailer units and portable jetters. Rioned have been around for 60 years developing, producing, selling, renting and servicing a complete range of drain cleaning equipment. During development of our products we place paramount importance on reliability, and input from those who use our machines has proved a valuable tool. Our product range includes: Spring machines, Combination units, High pressure machines and Inspection and detection systems. On our webshop you can easily order spare parts for your machine as well. High pressure hoses, nozzles, springs and accessories are just a few products you can order in our webshop. You will find the spare parts for your machine on this page.